ARE YOU FRICKEN KIDDING ME ! He’s named me Lumpy!?!?!!? I am not happy about this at all. What kind of crap name is that? What happened to my exotic name like Jasmine or Scarlett? 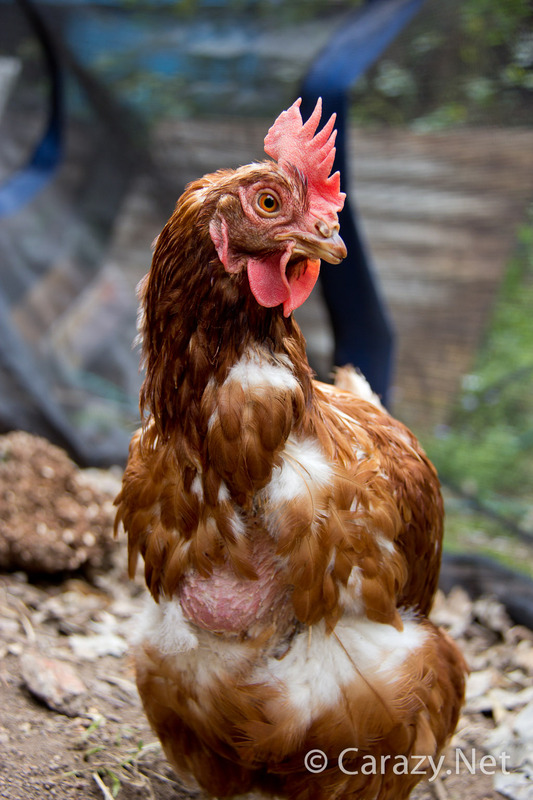 Just because I came from the egg farm with all my breast feathers pulled out and my skin exposed and well yes it’s kind of bulging, doesn’t mean I want to be lumped with a name like Lumpy. I am so livid I could spit giblets. Look at me. I’m a beautiful lady. The worst part is I actually run to him when he calls out Lumpy. I can’t help it, after all he is Treatgod and he always has something special just for me. Breathe in. Breathe Out. I can get through this. In less disconcerting coop news the other ladychickens are getting more adventurous and they’re slowly picking up on the lessons the silly human is trying to teach us. Yes that’s right, we’re getting taught how to be chickens. We do learn fairly quickly given that our lives have consisted from birth of singularly being egg laying machines. Up until this point there just hasn’t been time nor opportunity to be a chicken. He hides treats in piles of organic matter so that we have to scratch around to get to them. Sometimes it’s a simple mat of sprouted seeds that he lays out and we slowly check it out and peck at it. Other times he digs out worms and puts them in front of us and we stare at them unsure what so do. At first I thought “I’m not eating that.” After all food shouldn’t move around! But once I finished playing around with the wriggly little thing, I popped it in my mouth and boy was it delicious. Now it’s a fight to get the worms before the others do. Fortunately Treatgod always has a few spare ones that he keeps aside just for me! It’s now just over a week and our bedtime time is still driving Treatgod carazy! Despite the fact that we’ve finally learned to go into the coop at night which he’s extremely happy about, the roosting bar is still proving to be a challenge. We’re not sure of the protocols involved as we’ve never done this before, so we kind of make it up on the fly. Needless to say things are not going well. 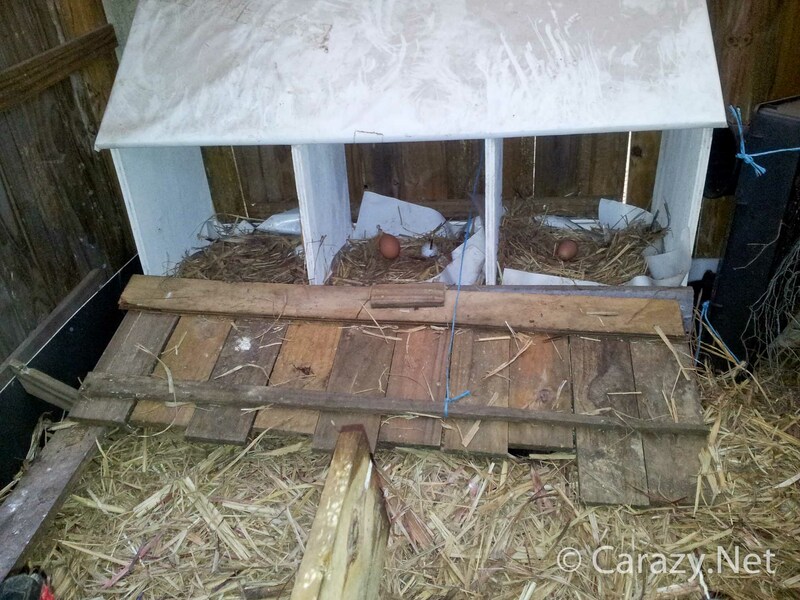 To stop us from sleeping in our preferred nesting box abodes, Treatgod has had to build a special hinged door in front of the nesting boxes that he can pull shut, using twine that runs to the external egg collection door. 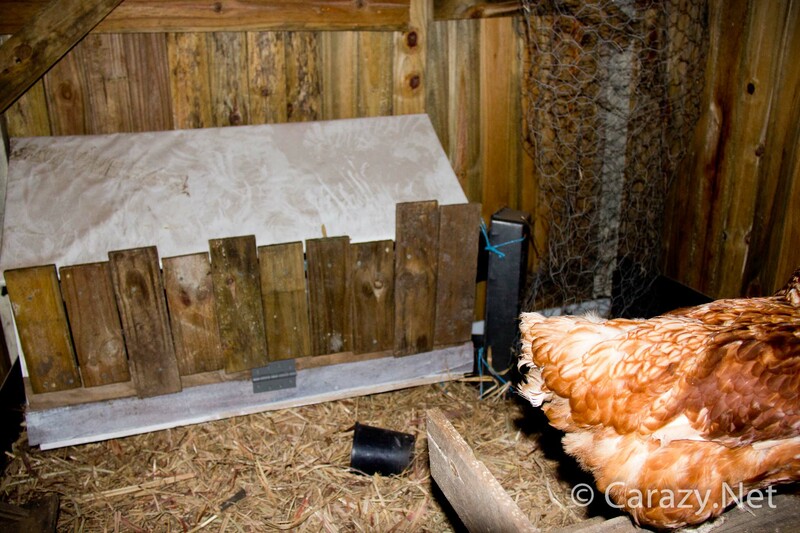 It’s basically a drawbridge he can use to completely block entry to the nesting boxes. 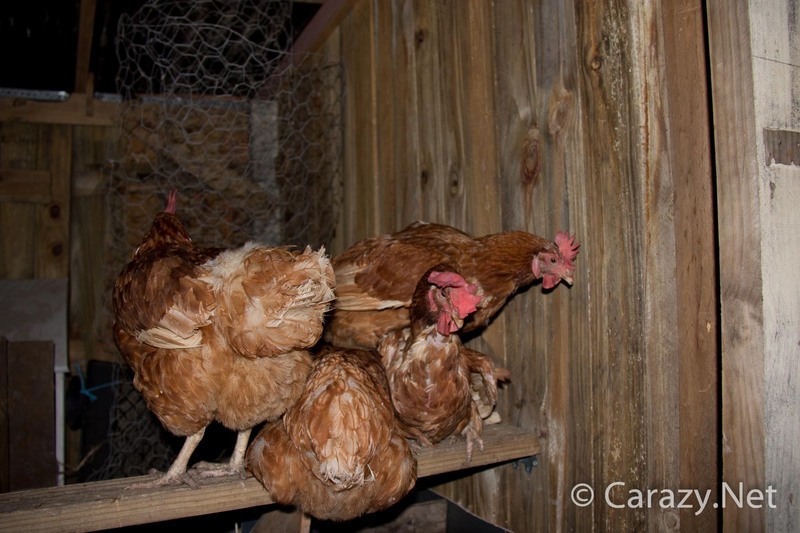 So now when we go into the coop at night, we just stand there and screech at the barrier until we realise that it’s not activated by annoying chicken noises. 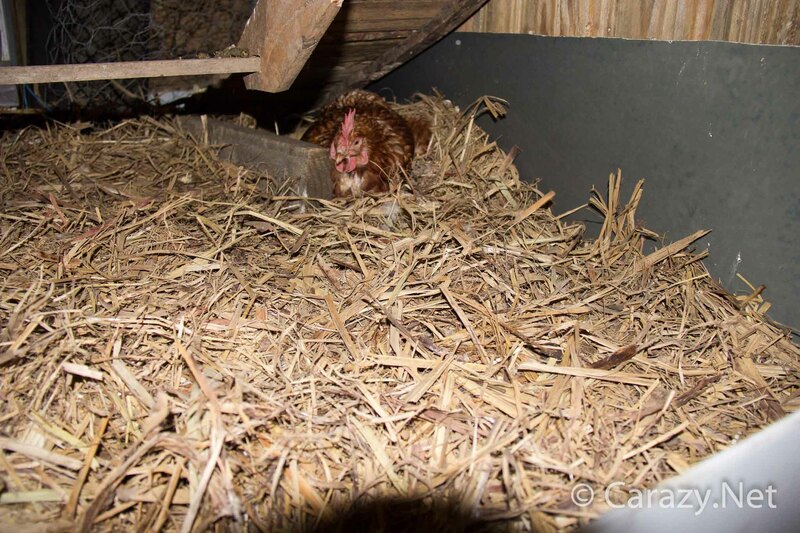 The downside to this is that every night he has to come down to the coop after we’re all asleep and lower the hatch using the twine that runs to the egg collection door. He’s not a morning person as you’ve probably garnered from my previous posts so this lowering is best done at night. He has to ensure he lowers it slowly because there’s always one silly chicken who sleeps in it’s path. They ultimately learn it’s not the best place to hunker down. 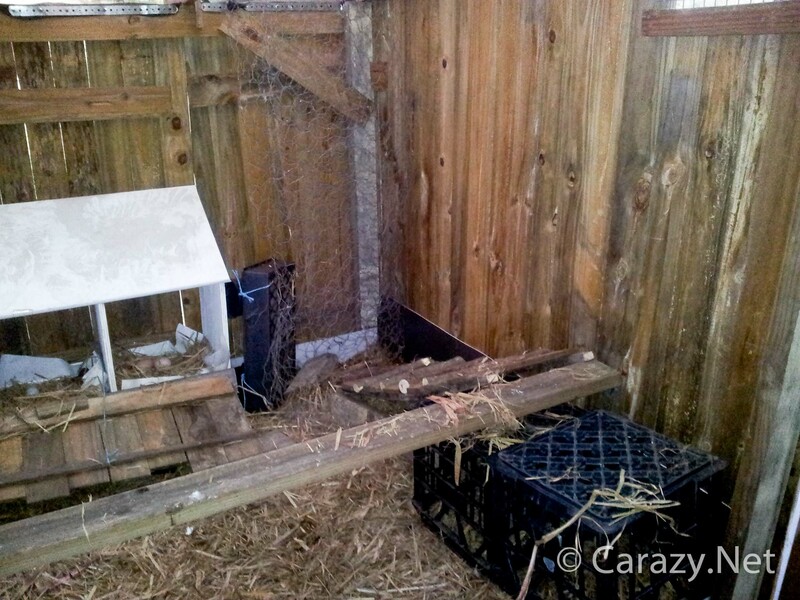 Here you can see the nesting box drawbridge in place. NO CHICKEN SHALL PASS! 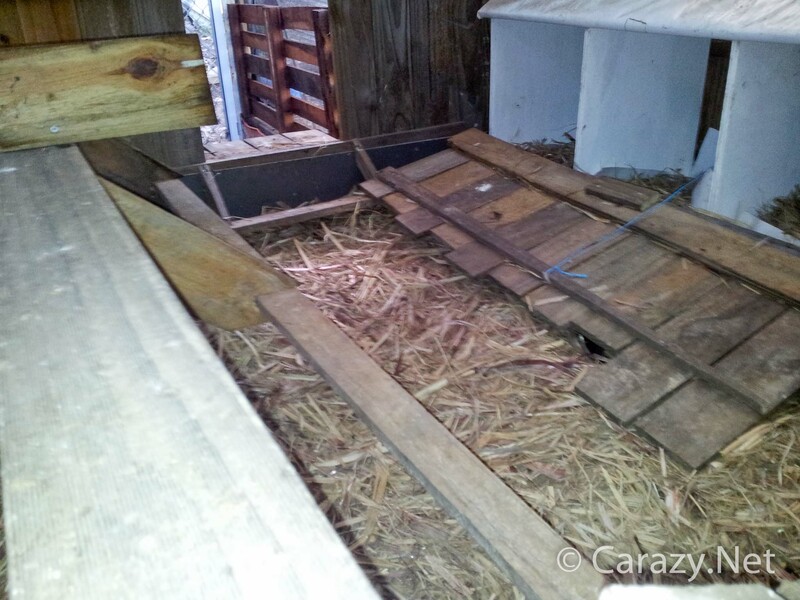 With the nesting boxes blocked off we then look for alternative sleeping quarters which usually means a chicken pile in the corner. 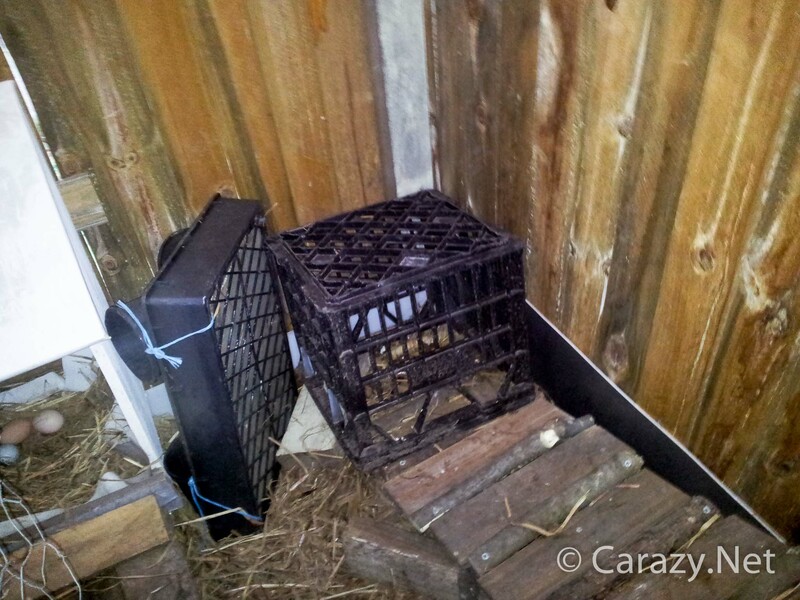 So to counter that, the sneaky human shoved milk crates and seedling trays in there. 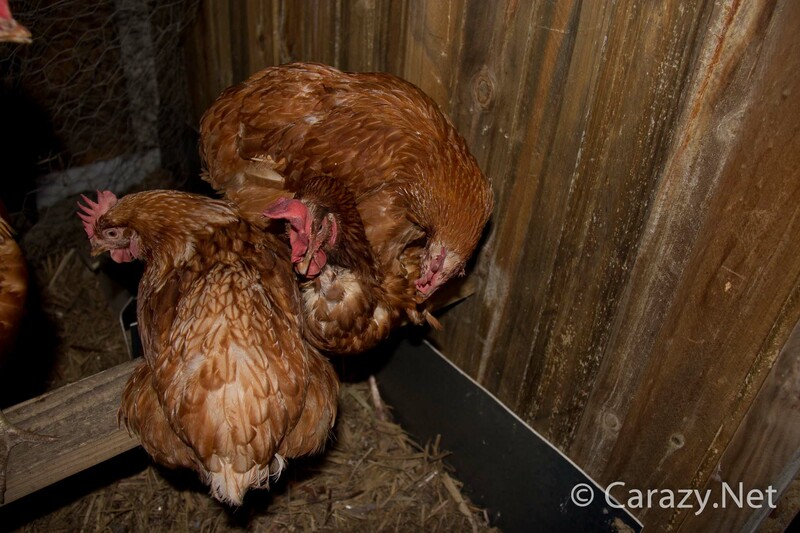 But we’re way too smart for him so we do our chicken pile on top of the milk crate and perch on the tray too! This confuses him even more because surely we could just go sit on the nice roost he built us which is the same height and much easier to get up onto than the crates. But no. So he ups the ante and shoves a big roll of chicken wire in the corner. 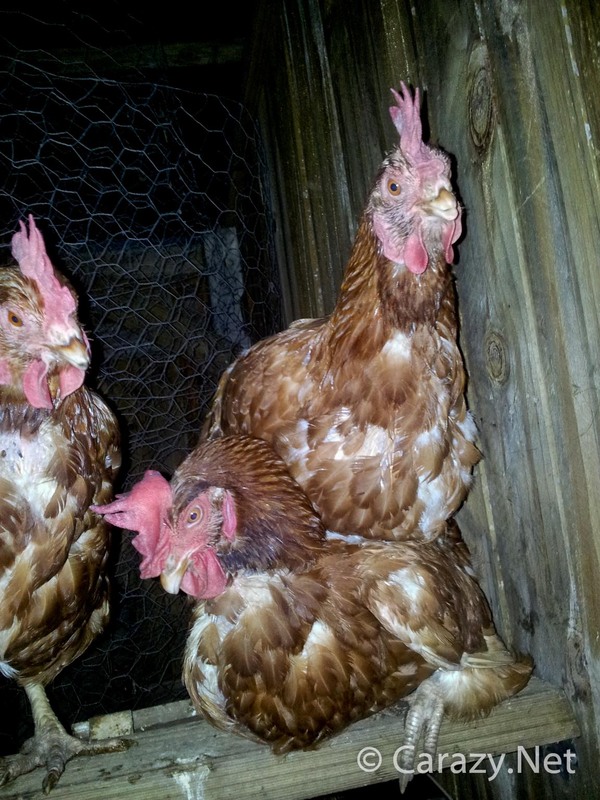 This seems to work and a lot of angry squawks result when the girls try to get to their favourite spot. Which leaves the other corners of the coop. So those corners also get the milk crate treatment. 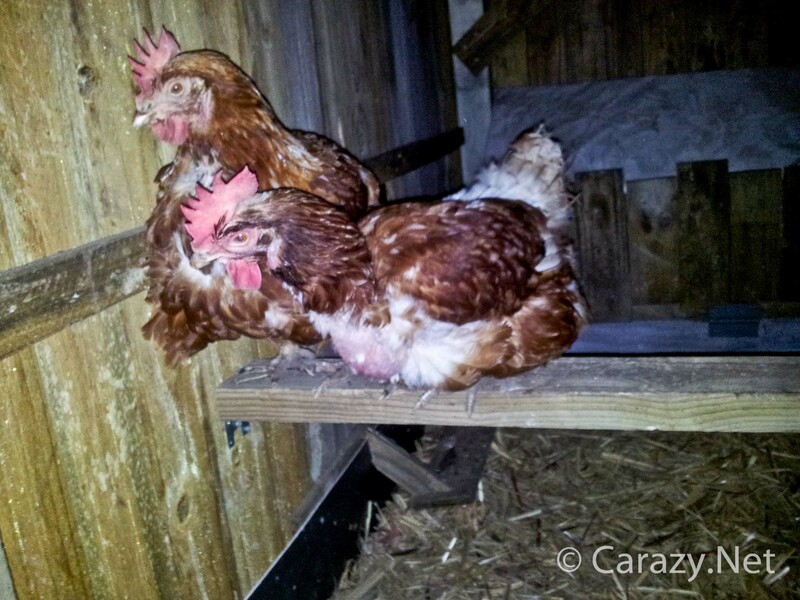 At least these corners are closer to the roost so there’s a chance the girls will actually step onto the roosting bar. 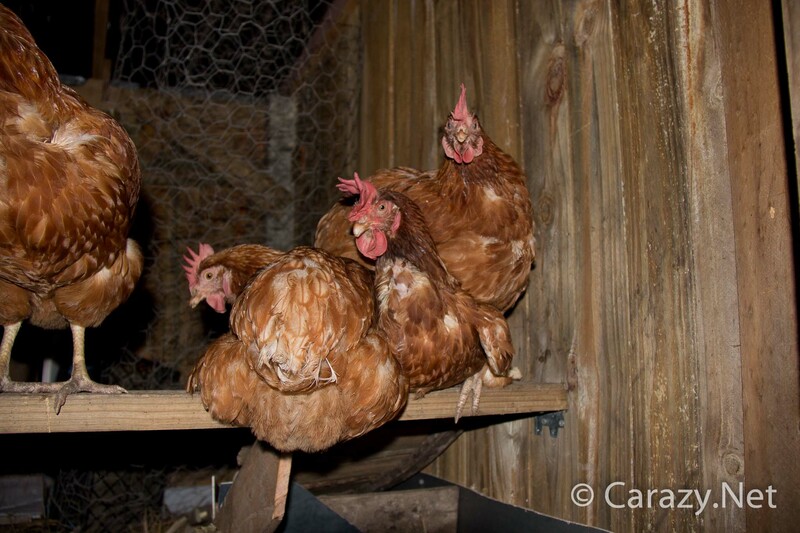 At this rate there won’t be any room in the coop at all. It’s becoming quite adversarial. Fortunately for us the human is relentlessly stubborn and continues to find new ways to train us. If he wasn’t, he’d probably give up and we’d all probably be heading to that chopping block we discussed in Day 1! With all the corners blocked off our bedtime pretty much runs like this. We walk into the coop. 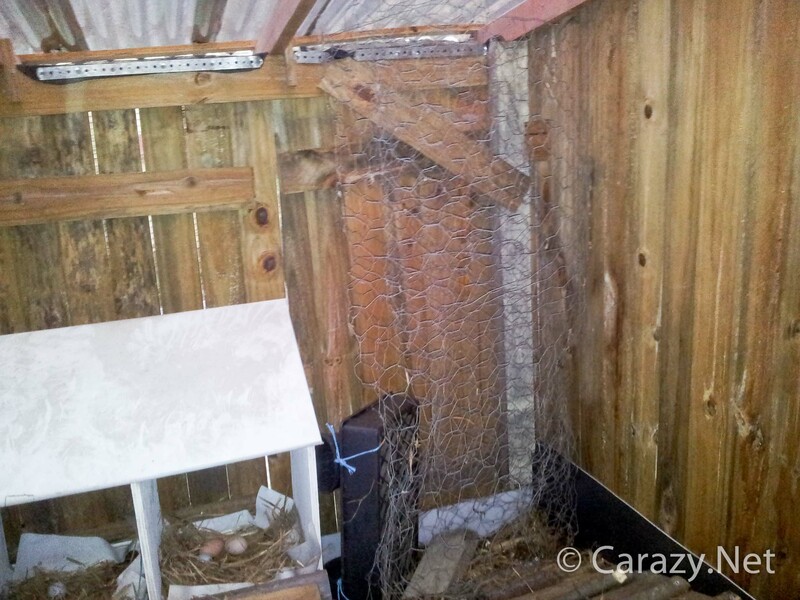 We squawk angrily at the closed off nesting boxes. 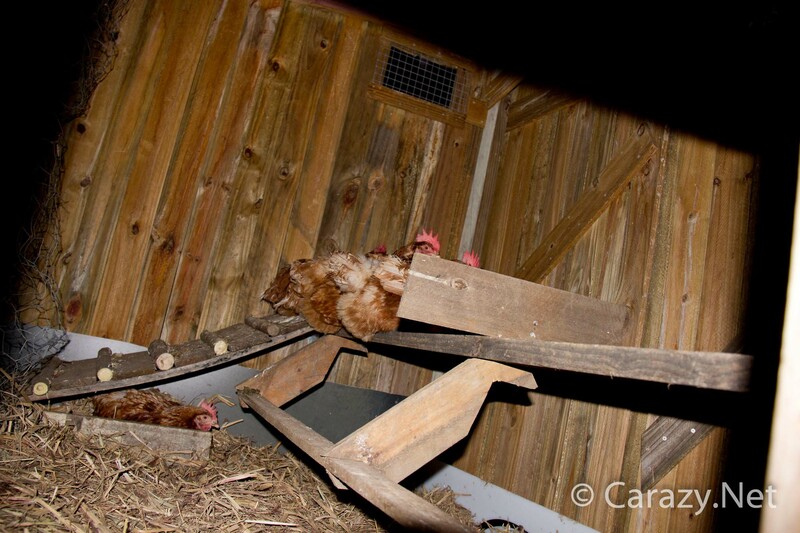 Then we turn our rage to the blocked off corners, then we head up the ramp to the roosting bar. Sometimes Treatgod will persuade us to move from squatting down in the middle of the floor with a little push towards the ramp. We eventually make our way up there. 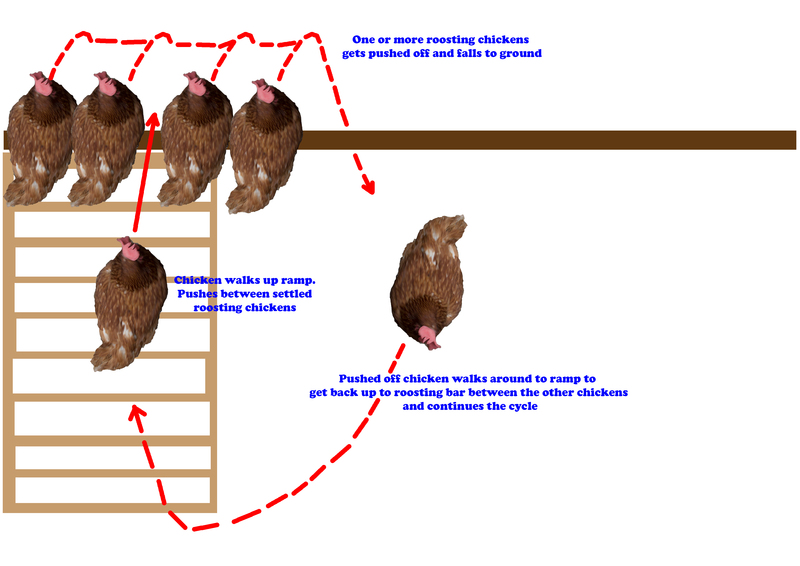 Even with all these barriers and clues left for us on “How To Roost” there’s always one stealthy ladychicken who finds a way to beat the system. This one managed to squeeze in under the ramp designed to take us to the roosting bar. Treatgod took this photo and walked back to his big blue house in resignation. It must be sad to be defeated by a bunch of silly chickens!